I'm going to take a chance and go into full-blown Old Geezer Dude mode. I've lived long enough to say, "When I was a kid..." and will take full advantage of it. And with what I think is good reason. When I was a kid, (told you I'd say it!) Halloween was all about FUN. Candy. Putting on a cool costume. Trick or Treating. Candy. Going door-to-door with your friends and getting enough candy to last until Thanksgiving. Yes, I know kids still do that but now other stuff has crept in. Gruesome stuff. Grotesquely scary stuff. You know what I mean. You see it everywhere--in yards, in stores and don't even ask about what you see on TV or movies. Back in my day you'd see bed sheet ghosts in trees or paper bats in stores. Yeah, there were scary movies and stories but all that was part of the fun. It was scary like being on a roller coaster was scary--you knew what to expect, you screamed but knew you'd be safe and you talked about how great it was afterward. And the grownups wouldn't let you do it until you were big enough. But I'm not being an old grump here: there's a reason all this stuff bothers me these days. You ARE what you put into your minds, guys. That why I don't want to fill my head with all the gruesome stuff that comes around (and gets worse) every year. That also why you don't see me reviewing truly scary books. So let's concentrate this year on FUN. And to do that, I'm going to recommend some really good books that guys everywhere would like and are all about FUN. The first is from the terrific The Adventures of the Bailey School Kids series. All of these are about the "pretty weird grownups" that come to Bailey school--and may be more than they appear to be. Or maybe not. In this one, Dracula Doesn't Drink Lemonade by Debbie Dadey and Marsh Thornton Jones, Bailey School gets a new guidance counselor. He's from overseas and has a foreign accent. He all pale, doesn't come out during the day and the kids who see him--well, they all turn all pale too! Could he really be...? No, couldn't be! But maybe...This book was a lot of fun and even the few chills were fun. The next is a My Weird School Special by Dan Gutman. All guys know these books and how much fun they are. This one is no exception! In It's Halloween, I'm Turning Green, A.J. and friends go trick or treating. They hear that Mrs Yonkers has a special Halloween treat just for them. But no one knows where she lives. So they try to find her house but get lost! And they meet the Halloween Monster, who steals their candy. Will they ever find Mrs. Yonkers? Do teachers really paint him green? And what is the MicroMole 4000 Expandinator? You won't find out unless you read it, guys! And you'll laugh a bunch along the way. The last book was from the great Barbara Robinson, who wrote The Best Christmas Pageant Ever, one of the great books of all time. This one, The Best Halloween Ever, it's all about the Herdman kids again. The Herdmans. The worst kids in the world. They stuff kids in revolving doors. They take anchovies off pizzas and replace them with guppies. They hide during Halloween and steal everyone's candy and gum and money. They've gotten so bad, in fact, that they mayor called off Halloween. But the school decides to hold Halloween there, hopefully to keep Herdmans away. But Imogene Herdman finds out and tells all the kids that any place will be safer than school on Halloween night. So what happens? The lights go out. Kids go missing. And then--and then--well, the last thing you'd expect happens! This book was great fun. Even reading about the Herdmans is fun. And funny. Get this and read it, guys! And it mentions Chunky Fruit and Nut candy! How long has it been since I've had one of those? They were yummy! In fact, read all of these! Did I say they were fun? Maybe once or twice. They are Good Quick Reads and full of the humor guys love. Well, thanks for letting me get on my soapbox. Get these books, enjoy them and, just for fun, tell me what is your favorite Halloween candy! Everyone loves to laugh, right? Right! Guys especially enjoy a good loud laugh. That's one reason the Iron Guy is such a fan of Lenore Look's terrific Alvin Ho series--I always get good loud laughs from them. Just recently I finished the sixth book, Alvin Ho: Allergic to the Great Wall, the Forbidden Palace, and Other Tourist Attractions, and got several chuckles and smiles once again. And the smiles at the end were feel-good smiles and that's one of the reasons this books is so terrific. If you haven't met young Alvin, the second-grader, then you should know that he's afraid of everything. And there's so much to be afraid of, especially when you family is going to China to show off your new baby sister to the Chinese relatives. There's a 16-hour flight in a flying tin can full of recycled air, which as everyone knows, is full of viruses! Fungi! Bacteria! Then there are elevators in China on 34-story apartment buildings and who knows about the wires holding up those things! And what happens if you get LOST in this country of one billion people! Yes, they're a lot to be afraid of and it sure is funny when you see how Alvin reacts. Just wait until you see what happens when he goes through airport security! (they said to remove his shoes and clothes) Or when he's actually on the plane. Or waking up in China. Or when he loses his dad's passport, which is about the worst thing to happen in a foreign country. Then Alvin has to face the consequences of his actions and grow up a bit. Then he and his dad really do get lost in Beijing, the capital city of this country of one billion people. What happens then? Will he totally freak out? You've got to read to find out! I've heard that this is the last book in the Alvin Ho series. That's too bad in a way because I enjoy these books SO much, but, if it's true, then this is a good place to end. I was starting to worry about little Alvin. He's so afraid all the time and it's funny while he's a second-grader but he's got to grow up sometime, If he stays this way, he'll become one of those weird neurotic grownups. ("neurotic" is grownup word for "almost crazy") That's why the end of this book makes you feel so good. Alvin does some things that make you smile in a positive way. Without letting any spoilers loose, I can tell you that Alvin learns to put aside his fears and think about someone else's needs--which, all my joking aside, is the REAL definition of manliness. So you'll close this book feeling really glad--Alvin makes you laugh and then he makes you proud. So got out and find this one, guys! Especially if you've read the others. (you don't have to read them in order but you'll enjoy this one more if you start with the others) And, like the others, it's a Good Quick Read. 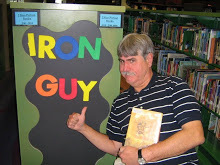 (grownups and teachers--if you have boys who may not like to read, this series is a good place to start) If you want to find out more, click on the "Alvin Ho" or "Lenore Look" tabs under this post. and if you ARE a fan of Alvin, write a comment or a review in the Comments section under this post. OK? Go forth and read! Comment! Review! And enjoy! 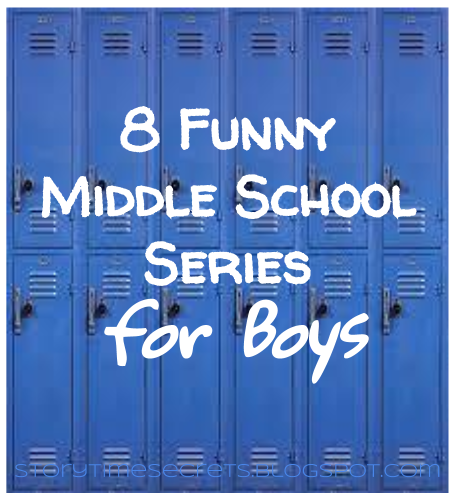 Hey, everyone, I've just read a post called 8 Funny Middle School Series for Boys at this terrific blog called Story Time Secrets. There are some really good recommendations there, so take a look. And let me know if you've read any of them. Thanks, Katie Fitzgerald, for telling reader guys about these great reads! Hey, you truly rocking reader guys, you may remember that I said that I love this time of year because that's when the coolest books come out. As proof of how right I was, I offer as evidence Percy Jackson's Greek Gods by the incomparable Rick Riordan. This is one TERRIFIC book that guys everywhere will enjoy. If you're a Percy Jackson fan, like me, this is the book you MUST read! And if you're not (and it's hard to imagine anyone who's not a Percy Jackson fan), this is still the book you've gotta read. It will make you laugh, thrill and choke and shudder at some of the stuff those old Greek gods did. Python opened his eyes. "What do you want?" "To sing you a song about my awesomeness." "Oh, please, just kill me now." "Okay!" Apollo drew his bow and shot the snake between the eyes. There are so many more examples. Just wait until you hear Athena and Arachne trash talk either other before the weaving contest. But there's more than just humor. We must remember that these old myths were stories. There are still reasons we tell them thousands of years later. They are still great stories. They still excite and move us. We want to find out what happens next. Take a look at the story of Typhoeus. Or the story of Persephone. And no one tells a story like Mr. Riordan. This book will keep your attention, make you laugh, make you thrill, make you disgusted (some of those gods were disgusting--more about that in a minute) or do all those things at the same time. I haven't enjoyed a Rick Riordan book this much since I first read The Lightning Thief these many years ago and a whole new world of enjoyment opened up for me. This is it, guys! Get to your local library and check one out. BTW, did I mention the totally great illustrations by the fantastic John Rocco, the guy who's done the Percy Jackson book covers? Well, he has created the absolutely perfect pictures for this book. Drama, awsomeness, creepiness, more awesomeness. That's what you'll see in these illustrations. OK, I do need to add a NOTE TO THE YOUNGER READER GUYS AND OR THE GROWNUPS. If you are a seven or eight or even a nine-year old or if you're the parent of one, this may not be the book for you. These old Greek myths dealt with some revolting stuff, like the stories dealing with the Titans and their encounters with the gods. And the gods themselves were pretty disgusting at times, willing to transform poor mortals into yucky things or put them in awful tortures for the pickiest reasons. And they spent most of their time chasing around for...well, you know. The brilliant Mr. Riordan presents all those stories entirely appropriately for older kids. I'd call them PG rated. If you are or have a younger reader guy, you might want a book such as D'Aulaire's Book of Greek Myths, a G-rated book and an oldie but goodie and maybe the best intro to Greek mythology for kids ever. Hey, I haven't checked in on this blog in forever! I just thought this would be a good way to get out a realy goodbook series that not a lot of people read,Wereworld. Wereworld is a book series based on WereWolves, but Curtis Jobling(The Author) goes in much further with it. He creates a 6 book series about WereLords. WereLords are called therianthropes. Therianthropes are humans that have the ability to change into animals. In the first book Rise of the wolf , we meet the main character Drew Ferran. Drew is a simple boy who lives on the farm with his Mom, Dad, and brother Trent. One day Drew is out in the field collecting crops, when he feels as though he is being watched. He goes inside to go to safety. Soon, the beast that was in the field with him, jumps in through their window and kills his mother. Drew gets angry while the beast is still there and starts to change, his body becomes bigger, hairier and bulkier. He doesn't know what is going on with him, but he starts to fight the beast in front of him. The beast is too powerfull for Drew, but Drew manages to rip a scar across the beast's chest. The rest of Drew's family comes in and think Drew killed his Mom. Drew then flees and lives in the forest as WereWolf in the forest until he comes upon two people named Master Hogan and Whitley. From there on you must read the book to find out what happens next. Thanks, Sammer! These books sound good and the library has several of them--in fact, I think we have the whole series. Take a look, guys, check some out and tell us what you think!